This is a simple tutorial that will show you how to make Sweet Potato Noodles. Sweet potatoes are all the rage right now, and understandably so. Not only do they boast great flavor, they’re packed with fiber, beta-caratone and micronutrients. They’re low on the glycemic index, making them a great paleo friendly food option. 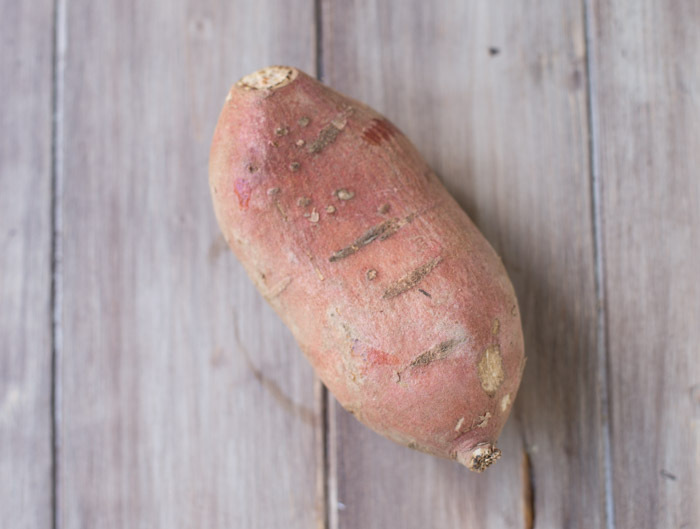 Sweet potatoes can be prepared in many different ways, including baking, grilling or sautéing. Mash a baked sweet potato and use it in sweet potato casserole. Drizzle grilled sweet potatoes with olive oil and serve with grilled chicken. 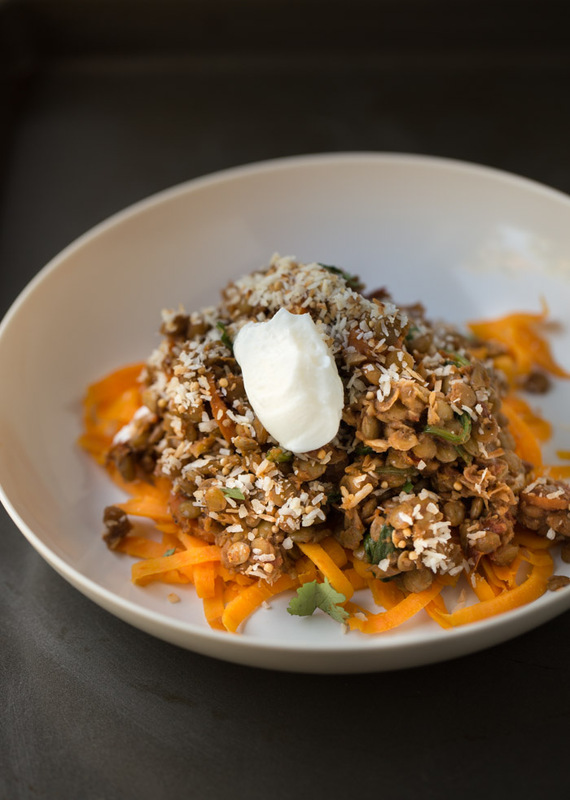 Saute diced sweet potatoes and serve with eggs for a healthy protein packed breakfast. 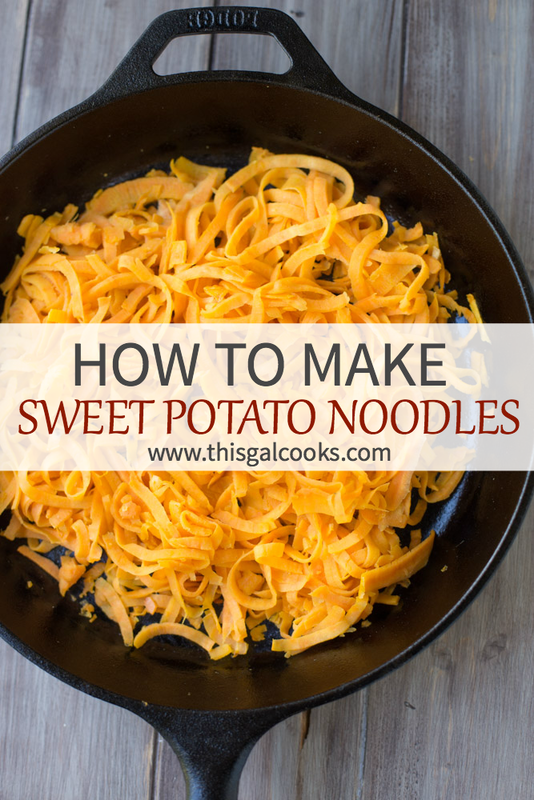 Sweet potatoes can also be used to make gluten free sweet potato noodles. Today I will show you how to make sweet potato noodles. If you follow my simple tips, you should be a pro after your first try. Choose thinner sweet potatoes that are similar in circumference to zucchini. Using thinner sweet potatoes will make the spiralizing process much easier. Fatter potatoes won’t fit into the spiralizer without cutting them in half lengthwise. For this batch of sweet potato noodles, you will need two medium sized sweet potatoes (yields 4-5 cups of sweet potato noodles). Once you’ve chosen your sweet potatoes, peel, wash and dry them. Use your spiralizer to sprialize the sweet potatoes. I used a hand-held sprializer, which was slightly difficult to use for a sweet potato. 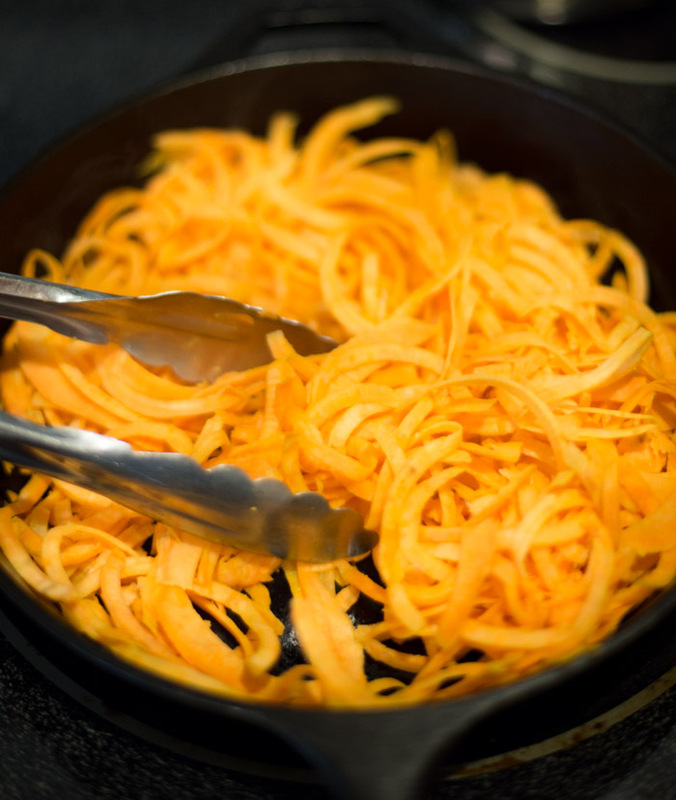 If you don’t own a spiralizer, you may use a julienne peeler to create sweet potato noodles. Hold the potato in one hand and slowly pull the julienne peeler down the potato with your other hand. Repeat this process until the entire sweet potato is “peeled”. NOTE: using a julienne peeler is a tedious process but it can be done. Cook the sweet potato noodles. Place 1 tbsp of extra virgin olive oil in a 10 inch skillet (I used cast iron but you may use stainless steel) and heat over medium high heat. Add the spiralized sweet potatoes and toss with tongs to coat with the olive oil. Continue to toss with the tongs every few seconds to prevent the potatoes from burning or becoming stuck on the bottom of the skillet. Do this for 5-10 minutes. The cooking time will depend on your preferred texture of the noodles. If you love a little crunch, cook for 5 minutes. If you prefer soft noodles, cook for 10. Sample a noodle to find out if it’s reached your preferred texture. Once the noodles are done cooking, remove from heat and serve directly from the skillet or in serving bowls with whichever sauces or topping you prefer. I topped the noodles with Spiced Braised Lentils (adapted from Food 52’s Genius Recipes cookbook; recipe will be shared on this blog soon). Use your spiralizer to sprialize the sweet potatoes. I used a hand-held sprializer, which was slightly difficult to use for a sweet potato. If you don't own a spiralizer, you may use a julienne peeler to create sweet potato noodles. Hold the potato in one hand and slowly pull the julienne peeler down the potato with your other hand. Repeat this process until the entire sweet potato is "peeled". NOTE: using a julienne peeler is a tedious process but it can be done. Cook the sweet potato noodles. Place 1 tbsp of extra virgin olive oil in a 10 inch skillet (I used cast iron but you may use stainless steel) and heat over medium high heat. Add the spiralized sweet potatoes and toss with tongs to coat with the olive oil. Continue to toss with the tongs every few seconds to prevent the potatoes from burning or becoming stuck on the bottom of the skillet. Do this for 5-10 minutes. The cooking time will depend on your preferred texture of the noodles. If you love a little crunch, cook for 5 minutes. If you prefer soft noodles, cook for 10. Sample a noodle to find out if it's reached your preferred texture. 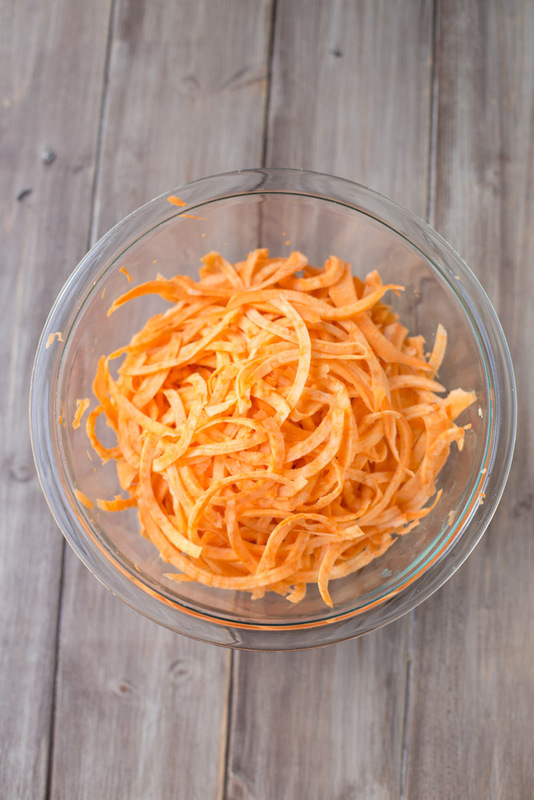 Choose thinner sweet potatoes as they will be easier to use in a spiralizer. And that, my friends, is how you make sweet potato noodles. This is just brilliant, Julie! Can’t wait for the lentils recipe that goes along with! I hope to get the lentil recipe up next week! It’s darn good and tastes great with the sweet potato noodles! I have yet to try sweet potato noodles but I LOVE this!!! will give this a go soon!!! love! Hope you enjoy the sweet potato noodles as much as I do, Alice! These are super intriguing- I have yet to try veggie noodles but they look amazing and i love the color!